Kensal Rise Library Awarded £75,000! WE CAN RUN OUR LIBRARY! TWO SUCCESSFUL EVENTS IN JULY! 1st July Open Day in the library 2nd July Actor’s Night Fundraiser. Open Day in the library. The local community gets to view the library space before our works begin. Very emotional being inside after so long. Actor’s Night Fundraiser: brilliant night of words and music. We raised over £3,000 for the library. Thank you to all the cast for such a wonderful performance and their continued support. Tamsin Greig, Paterson Joseph, Ron Cook, Rick Leaf, Haydn Gwynne, Lucy Cohu, Stephanie Schonfield, Ben Miles, Emily Raymond, Gideon Coe, Tim Lott, Robin Tyson and Friends. Tamsin Greig, Lucy Cohu, Ron Cook, Hadyn Gwynne, Paterson Joseph, Rick Leaf, Ben Miles, Emily Raymond, Stephanie Schonfield, DJ Gideon Coe, Counter tenor Robin Tyson, Novelist Tim Lott! Audiences have loved our live performances of literature by award-winning local actors. We are delighted to welcome them back on Sunday 2nd July at St Martin’s Church, Mortimer Road (just 2 minutes from Kensal Green tube). The evening is very much an ensemble affair with a cast of award-winning locals that include actors: Lucy Cohu, Ron Cook, Tamsin Greig, Hadyn Gwynne, Paterson Joseph, Rick Leaf, Ben Miles, Emily Raymond, Stephanie Schonfield and also Radio 6 DJ Gideon Coe, Counter tenor Robin Tyson and novelist/Guardian columnist Tim Lott. Also a raffle, bar and nibbles! Advance Discount Tickets at £10 are available from C&D Food and Wine (opposite Kensal Rise Library) Queens Park Books (Salusbury Road) and Daniels Estate Agents (Chamberlayne Road, Kensal Rise). £12 on the door. All proceeds will go directly to the library. Beautiful photo of our new library sign taken by Allen Samuels. Interior refurbishment works will start soon. 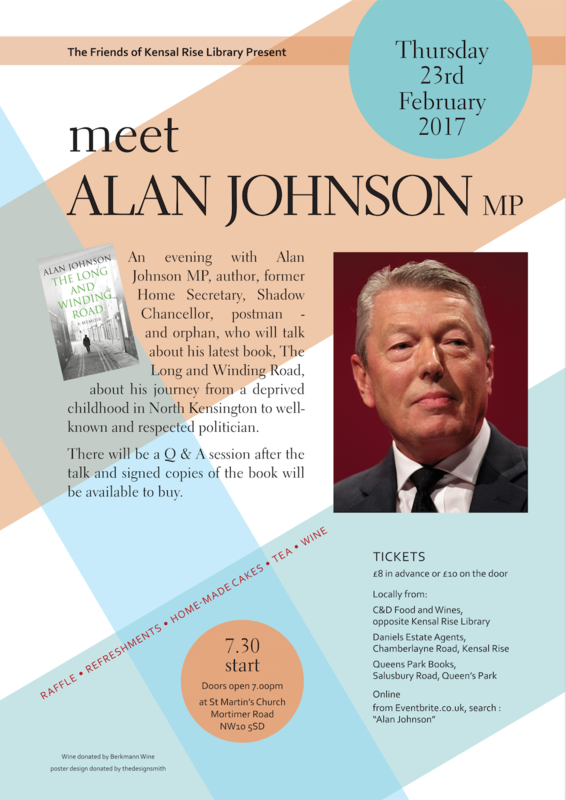 An Evening with Alan Johnson MP, ex Home-Secretary, author, postman, orphan. We raised over £2,000 at this recent fundraiser which was very well attended. Alan Johnson MP, shared tender recollections of times and places along the road to his parliamentary career. Places and times marked by deprivation and loss as well as resilience – of individuals and communities. Alan was speaking to James Denselow, local Queens Park councillor (picture) – and also took audience questions. In defence of libraries Alan said: “Books furnish the mind in a way that bailiffs can never repossess”. Alan also expressed a wish to be invited back for our opening – he has been involved in supporting a community library back in his constituency of Hull. He will be very welcome. We are grateful to both Alan and James and to our sponsors, Daniels Estate Agents, as well our Indulgent Raffle prize donors: Scarlet and Violet, Snipkidz of Willesden, Berkmann Wines, Tabitha Robertson and Mauli Rituals. Also to Lisa at Queens Park Books for her support. Last but not least, thank you Rev Graham Noyce and our fantastic volunteers for helping to make the night so special and welcoming. Alan signing copies of his book. 2. Refurbishment of the library: if you walk past the library you will see that the works by the owner, Uplift, are progressing and nearing completion. Our new library door has been fitted; works have started on the outside, with a new wall and areas for landscaping. We have been busy with finalising our 999 year lease with All Souls College and the specification of our works which will commence as soon as the owner completes theirs, which we hope will be in the next couple of weeks. We have appointed a firm of architects (www.seh.co.uk) who are project managing the entire works for us. SEH have expertise in the design and build of libraries so we are in good hands. They commenced work with us in November and have made very good progress with the design and planning of works that need to be done – and there is a lot of work to be done. They have taken on board the ideas and suggestions made at the public consultation we had and we are excited about the new library and community space that is taking shape. We are able to complete both Phase 1 and Phase 2 of our refurbishment works thanks to the success of our fundraising, and also before the December 31st deadline we had set ourselves. Importantly, our application to Power to Change (PTC) was successful and we were awarded £75,000 by them. The PTC grant augments the funds that we have already raised from our events and donations. This means that altogether we have raised £160,000 in just under seven months – a remarkable achievement by The Friends of Kensal Rise Library and with the generous support of the community, an anonymous donation of £10,000, the Foyle Foundation, The Garfield Weston Foundation, Brent Council and our sponsors Daniels Real Estate, Kensal Rise. 4. Phase 3 Annual Operation of the Library – we are now fundraising for £40,000 so that we can operate the library in its first year. We will need to raise this every year. Costs include; staffing; service charges; insurance; utilities; stock; broadband; copier; stationery etc If you would like to help with these costs go to our website, www.savekensalriselibrary.org and press the MyDonate button. Many thanks to Robert Yewdall for his very generous donation of £500. 5. Library Committees – our committees, Finance, Operations, and Communications meet at 7.30pm on the first Thursday of every month in the Long Room behind St Martin’s Church in Mortimer Rd, Kensal Green. If you would like to volunteer to be involved in any aspect of the running of the library please do come along. We particularly need those with experience in IT, including website, and finance/fundraising skills. Come along and see how you can help. Professional Community Librarian? Apply for our innovative post! Following a successful grant bid to Brent’s Voluntary Sector Initiative Fund, the four Community Libraries in Brent, Kensal Rise, Cricklewood, Barham and Preston, are now able to appoint a professional community librarian. Travel information: Brent is within London Transport Zones 2/4. Professional community librarian is sought by a network of libraries in Brent, North West London, operating as independent volunteer-run community libraries. The Brent Community Libraries (BCL) network is made up of four community libraries, spread across Brent, which are at different stages of development and operation. The libraries are all registered charities and each library is supported by a strong group of residents. Brent is one of the most diverse areas in the country and this post offers the opportunity to develop services for people across a wide range of ages, backgrounds and abilities. The libraries are committed to providing a lively top quality service in their diverse neighbourhoods. We are in an innovative position, collaborating with each other, the local community and the council. This is a great opportunity to create an imaginative way of providing a library service. Applicants should have a professional library/information science qualification and at least 18 months’ experience of working in a library. Experience of working with community organisations and volunteers is desirable. The successful applicant will work to develop a community library strategy with the Trustees of each library, train and develop the volunteers who provide the services, and liaise with the Brent Library Service, which is strongly supportive of this project, attending meetings as required. He/she will work at each library, meeting representatives of the community library network by arrangement. Brent Council has agreed funding of £45k (ending Oct 2018) to BCL with the Friends of Barham Library as the contracting entity. £40,000 of this is available for this position. Closing date for applications is Friday 10 February. We have raised the £80,000 needed to complete the second phase of works – the kit out of the library – and well before the December 31st deadline we had set ourselves. We have just been told that our application for £75,000 to Power to Change (PTC) has been successful! PTC is an independent charitable trust set up with an endowment from The Big Lottery Fund. The PTC grant augments the funds that we have already raised from our events and donations. We have already raised £80,000 for the initial works. This means that altogether we have raised £160,000 in just under seven months – a remarkable achievement by The Friends of Kensal Rise Library and with the generous support of the community, an anonymous donation of £10,000, the Foyle Foundation, The Garfield Weston Foundation, Brent Council and our sponsors Daniels Real Estate, Kensal Rise. This is a wonderful early Christmas present and we will be celebrating with you all! Audiences have loved our star-studded, live performances of poetry and literature by award-winning local actors. So we are very pleased to welcome them back on Sunday 27th November at The Masons Arms pub, Harrow Road. Doors open 7.00pm for a 7.30pm start. Performers include Tamsin Greig, Haydn Gwynne, Samantha Spiro, Ron Cook, Richard Leaf, Stephanie Schonfield, plus Radio 6 Music DJ Gideon Coe, award-winning writer and Guardian columnist Tim Lott, and Allen Samuels. There will also be a raffle! Tickets at £10 are available in advance from C&D Food and Wine (opposite Kensal Rise Library) and Daniels Estate Agents (Chamberlayne Road, Kensal Rise).